Do you struggle with the prepositions? Do the various prepositions in English confuse you? Well have no fear. In this article, you’re going to easily learn the definitions for the various prepositions related to movement and location. Because prepositions don’t literally translate from one language to another, they can be one of the most difficult things for non-native English speakers to master. But it doesn’t have to be difficult. One reason prepositions can be difficult to wrap your head around [understand] is because it’s hard to visualize what they look like in your head. 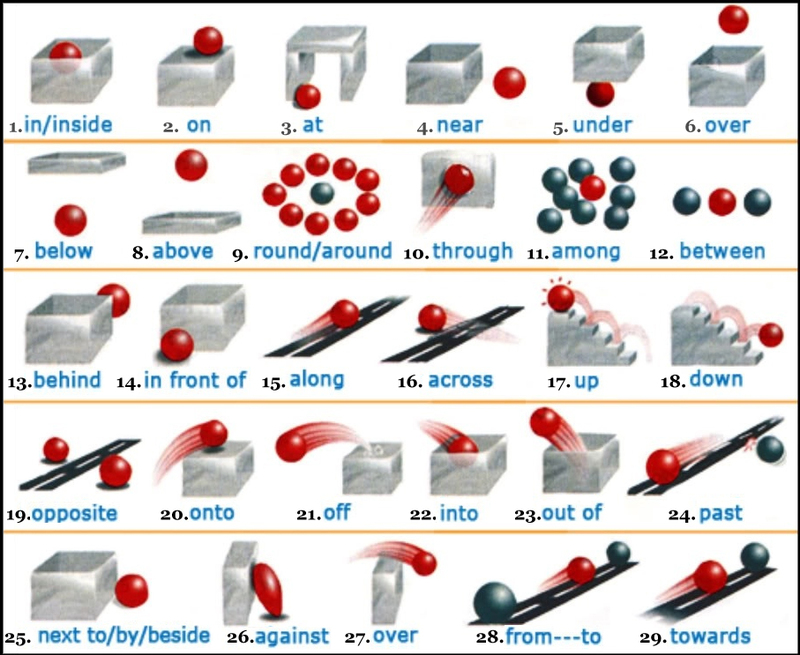 However, prepositions related to direction CAN be demonstrated with images. So check out the image above (click to view at full size). Then, for more information and examples, read the definitions below. NOTE: All the links below will take you to an awesome song in youtube that gives you a real life example of the preposition. 1. In/inside – when something is in the interior of a 3 dimensional object. The time is right for dancing in the street. 2. On – when something is on top of an object or surface. I prefer to sit on the floor. I just can’t wait to get on the road again. 3. At – expressing location in a specific place. 4. Near – a short distance away from (a place). The restaurant is near the bakery. 5. Under – directly below (generally 3 with dimensional objects). Under the bridge downtown I gave my life away. 6. Over – directly on top of, but not touching (generally from one side to another). In the high jump, you have to jump over the bar. Instead of going to the side of the rock, he drove over it. 7. Below – directly underneath (generally with 2 dimensional objects). Your stomach is below your chest. The ocean floor is miles below the surface. 8. Above – on top up/over something, without touching it. He held a bucket of water above her head. 9. Round/around – on every side of. The hills around the city are beautiful. I know for sure that life is beautiful around the world. 1o. Through – moving in one side and out the other side. The ball went through his legs. 11. Among – surrounded by. The strawberries are hidden among the trees. In the RLE Facebook Group, you’re among friends. 12. Between – in the space between two objects. The United States is located between Canada and Mexico. The dog walked between us and lay down at our feet. 13. Behind – at the back/far side of something. Look at the sunset behind you. There’s a naked person behind the tree. 14. In front of – the opposite of behind, a position at the front part of something. I’ll meet you in front of my house. Wait for me in front of the supermarket. 15. Along – moving in a constant direction on (a path more or less horizontal). We were driving along a narrow [thin] road. All along the watchtower, Princes kept the view. 16. Across – from one side to the other. She wants to travel across Europe. 17. Up – toward the sky or higher place. 18. Down – toward the ground or lower place. Everything that goes up, must come down. 19. Opposite – have a position on the other or further side of something. A large group of people gathered [came together] on the opposite side of the street. Opposite the school is a church. 20. Onto – moving to a location on (the surface of something). We got onto the train. He jumped onto the rock. 21. Off – moving away and often down from. He fell off the bed while he was sleeping. He jumped off the horse. 22. Into – to become enclosed/surrounded by something else. I want to jump into the water. 23. Out of – moving away from. Let’s get out of here. I’m tired. He got out of the water. 24. Past – in front of or from one side to the other. He walked past me without saying hello. The man drove past while honking his horn. 25. Next to/by/beside – in or into a position immediately to one side of. 26. Against – in physical contact with something, generally supported by it. When I’m tired, I rest my back against the wall. He stood with his back against the door. 27. Over – expressing passage or movement across the top of something. 28. From—to – from—the point in space where something starts, to—the point in space where something ends. He drove from his house to the store to get some fruit. I’ll send it along with love from me to you. 29. Toward – in the direction of. I walked toward the front door. Here are some tests you can take to make sure that you understand how to use these prepositions correctly. Real Life English likes making English as fun and as easy as possible, both online and in person. If you want to be the first to hear about our global English events, as well as new texts, podcasts, and other English learning tips, then subscribe to our newsletter and start learning real life English. Thanks for posting this articles and others at my facebook group English Teachers in Indonesia. Nice post! But the second test is not ok! I put all the answers in the senteces that I’ve made mistakes and none of them was correct!